Cliff has been associated with the firm since 1995. Cliff's practice primarily consists of workers' compensation cases. He has handled hundreds of these cases since joining the firm. 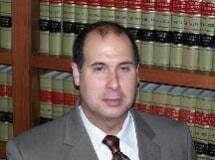 Although Cliff primarily practices in Miami-Dade, Broward, and Palm Beach Counties, he also accepts cases as far west as Lee and Collier Counties. Cliff grew up in Miami and attended undergraduate, graduate and Law School at the University of Florida. Cliff is married to his lovely wife, Ginger. They have two beautiful boys, Jacob and Dylan. As part of his commitment to injured workers, Cliff sits on the local board of the Friends of 440 Scholarship Fund. This Charity raises scholarship money for the children of workers who were either severely injured or killed on-the-job. These children rely on the scholarships so that they may attend college. In 2007 and again in 2008, Cliff co-chaired "A night With the Marlins". This is a fundraiser that partnered the Florida Marlins with the Scholarship Fund, and raised thousand of dollars for qualified scholarship applicants.